Dr. Ricardo J. Valencia has published an article about public relations and political opposition in El Salvador, in the latest edition of Public Relations Inquiry. In the 1980s, the Committee in Solidarity with the People of El Salvador (CISPES) became a key node in a vast network of political opposition against US foreign policy. In this article, we argue that these webs of political opposition constitute the geographies on which the public relations (PR) strategies deployed by CISPES were pursued and corresponding political opportunities were structured. We use newspaper analysis, interviews, and archival research to map three such networks in an effort to understand the changing climate in which CISPES pursued its political agenda during the 1980s. We conceptualize these networks as ‘networks of contention’ and contend that variations in these networks correspond to CISPES’ efforts to take advantage of unforeseeable political opportunities, which raised the profile of CISPES as well as its overall position as a radical activist organization opposing the Reagan government. We conclude by arguing that an attention to networks of contention is necessary for understanding both the strategies and tactics pursued by PR activists and the political opportunities that shape those tactics and strategies. Our analysis is sympathetic with the sociocultural ‘turn’ in the PR theory that assesses structural and contextual constraints on the strategies and tactics deployed by PR professionals. In the end, this article argues that the networks of contention that organizations find themselves in during particular moments of political crisis play a key role in shaping the kinds of strategies and tactics available to pursue them. We also contend that the collision between relationship management strategies and the contexts in which they are embedded suggests that the tactics and strategies pursued by PR professionals have to be embedded in and are structured by perpetually changing sociopolitical environments, which often refuse management and require constant strategic adaptation and flexibility. 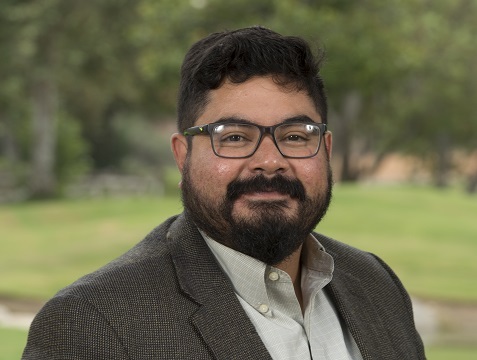 Dr. Valencia joined the Department of Communications as an assistant professor in Fall 2018. He is teaching COMM 362: PR Writing I and COMM 470: International PR. Dr. Valencia earned his doctorate in media studies at the University of Oregon, Eugene, where he has taught courses in public relations principles, campaigns and research. His research areas include transnational public relations, global media, political communications, nonprofit activism, public diplomacy, race and ethnicity, and whiteness. Prior to academia, Dr. Valencia worked as a journalist in El Salvador for eight years, and served as a communications and public relations counselor for the Embassy of El Salvador to the United States for four years. He has a B.A. in journalism and communications from Central American University in El Salvador and an M.A. in journalism, media and globalization from the University of Hamburg, Germany and Aarhus University, Denmark.